Cold, dark, sounds, movements...focus & execution. Being an avid outdoorsman, I partake in some very fun and challenging recreational activities. 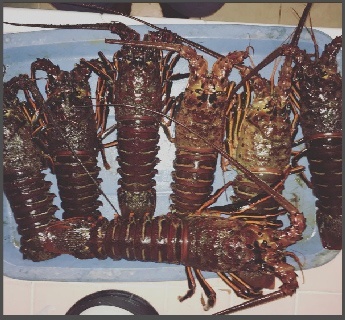 One of which is freediving in the cold night waters of the Pacific Ocean for California Spiny Back Lobsters (a.k.a Bugs). Similar to other types of hunting and fishing, knowing where to go is key. Some people have the luxury of secret spots passed down from generation to generation, and then there are guys like myself that have to put in the time and effort pre-season to scout and find out where we need to be, come season. Long countless hours spent looking, researching, counting, estimating. Freediving for lobsters at night is challenging, part of the reason I enjoy the hunt. Night dives tend to produce the best results, and in my experience, it is when the bigger trophies are on the crawl. Long, cold hours are spent in dark waters managing proper freedive breathing techniques and safety. Focus and Execution, doing whatever it takes to come out of the water successfully. Why the explanation on crazy dummies in the cold water looking for a sea creature nicknamed a Bug? Oddly enough, there are some similarities in strategy between my lobster hunting and our approach with Partners here at AppScale. With lobsters, it’s simple, go for the legal sized lobsters. No sense wasting time with the shortys. At AppScale we take partnership seriously. Our goals are to increase mutual exposure and close mutually profitable business. Each potential partnership gets scouted, researched, strategized and evaluated before it is invoked. Know the goal, figure out the steps to accomplish, then Focus and Execute. We are persistent; we put in the work and effort to bring the partnership to completion. No matter the time zone or type of work that needs to get done, here at AppScale we do what it takes to overcome any hurdles or roadblocks that inevitably arise. Now it’s time to jump in, the big trophies are out there. By joining AppScale's Partner Program you will develop winning solutions for your client's needs, increasing your customer base and revenue. Contact us today to discuss how we can increase your business as an AppScale Partner!